Extreme Preppers: How Far is Too Far? 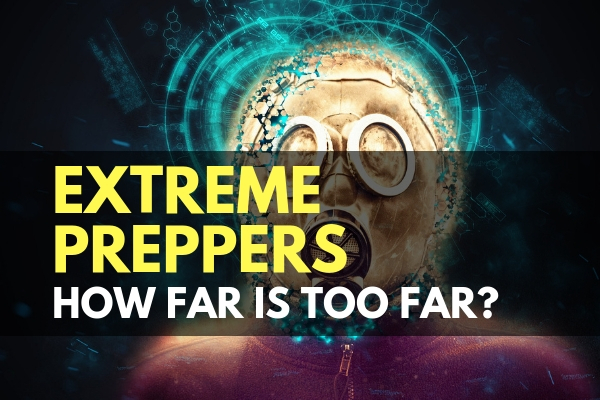 Extreme preppers have always been in the spotlight whenever preparedness, prepping, or survival comes up. To the casual outside observer, it is easy to compartmentalize all of prepping as an ‘extreme’ activity. If you are not prepared, the perception is that being prepared is not mainstream. This is the most dangerous perception, since preparedness and risk analysis is already an important part of what everyone does each day, and prepping is simply conducting those with clarity. 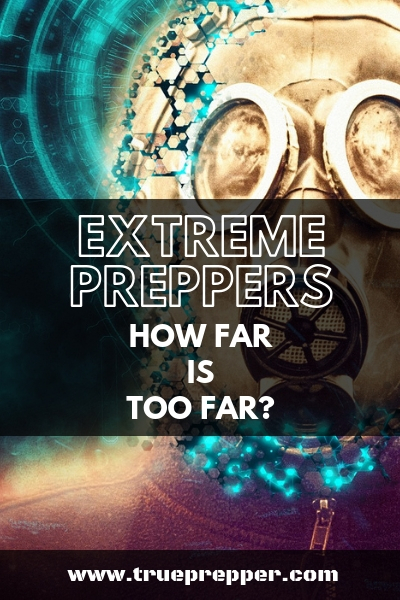 Contributing to the ‘extreme’ perception of prepping is counterproductive, and we are going to have some self-reflection going on in this article to dissect how we can help eliminate this problem. The classic National Geographic Channel show “Doomsday Preppers” that aired 2012-2014 is culturally the largest thing to happen to prepping. The New York Times described the show as “an invitation to laugh at lunatics tunneling into mountainsides to escape a Russian nuclear attack.” The aloofness of that comment and reporter are plain to see, but his description was accurate if you have seen the show. The CDC actually paired up with National Geographic to share practical advice during the show- but they failed to realize that people were laughing and marveling at the show rather than tuning in to learn about prepping. The obscene budgets and spending habits by participants on the show give those that are interested an prepping a convenient excuse not to. The show illustrated that prepping is really expensive. In my experience, the contrary is correct. The prepping community is frugal, and is simply willing to budget small amounts today to prevent large expenses and burdens later. When it comes to prepping, ‘extreme’ can go two ways. Extreme prepping can describe over-preparedness for unlikely or near-impossible risks… or it can describe a complete lack of preparedness. Doomsday Preppers illustrates the first option, and that is what is so often on people’s minds when prepping is brought up. The second option, however, shows up so often that we are almost blind to it. A large-scale lack of preparedness is visible almost every time there is a local emergency or regional disaster. Hurricanes Katrina, Sandy, Florence, and Michael show us how millions of people were unprepared for hurricanes in the peak of hurricane season. Puerto Rico showed the public how an entire territory can depend on the government for disaster aid. Ground your conversations with would-be preppers and ‘newbie’ preppers with practical solutions for practical risks. The Gerber Zombie Kit is pretty slick and could come in handy, but there are a ton of other more practical ways to prep with $300. Framing your prepping journey around zombies can be exciting, but it is obviously not that practical. If you took that $300, you could get a great start on your food storage, expand your survival kit, or even complete your bug out bag. All of those would be much more important if you were faced with any survival situation except maybe a zombie uprising. Actually, they would still be more important. How you prep affects the prepping community as a whole. Get a solid foundation with practical prepping and ignore the scenarios entertained by extreme preppers. The more people that are prepared, the better off the entire world is. Extreme preppers may make for a good punchline for a joke, but practical preppers are much more common than you may think. Prepping gives our way of life, society, and our families a resiliency that is, unfortunately, uncommon today. Learn about the risks you could encounter every day with our TrueRisk index to make sure you are on top of every likely and plausible threat. Keep exploring, stay prepared, and be safe.